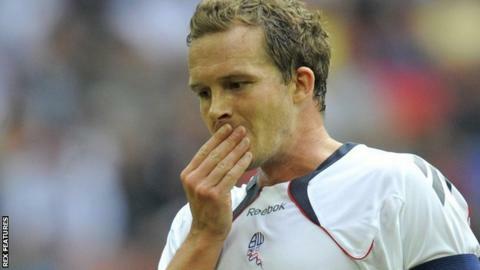 Former Bolton captain Kevin Davies says the club has "lost its soul" since his time there between 2003 and 2013. Davies, 38, was part of a golden era for Wanderers which included top-flight football, a League Cup final, FA Cup semi-finals and a European campaign. However, relegation from the Premier League in 2012 led to financial difficulties and this season the club are bottom of the Championship. "It's gone away from the club it used to be," he told BBC North West Tonight. "I've been concerned for a while. From when I was there it's gone a bit sterile, the fans don't feel part of the club any more and it's just lost its soul." Highlights from Davies' 10-year spell with Bolton, during which he played 407 games and scored 84 goals, included a League Cup final strike against Middlesbrough at Cardiff in 2004 and a famous equaliser in the 2-2 Uefa Cup draw at Bayern Munich in November 2007. He was also capped for England during his time at the club, coming on in a goalless draw with Montenegro at Wembley in 2010 at the age of 33. Bolton's financial plight has worsened since dropping out of the top tier, with debts of £172.9m announced in April. The Trotters have brought in an advisor in Trevor Birch with a view to overseeing a takeover of the club, and current owner Eddie Davies has offered to write off his loans to help smooth the process. "It's not about him getting the best deal and the most money, it's about securing and leaving the club in good hands," his namesake Kevin added. "I think it's something he'll take his time over, but I think the plan is to get the deal done before Christmas."